MultiBrief: Manufacturing growth slows to end 2018. What’s next? While President Trump and others extol manufacturing sector growth, the year ended with the standard manufacturing production number dropping from 59.3 percent in November to 54.1 percent in December. While any PMI number over 50 still indicates growth, this is the lowest figure since November 2016 and the largest monthly drop since 9/11. The decline caused more anxiety in a topsy-turvy market amidst a government shutdown. Some say the decline is caused by the ongoing trade war with China, and others suggest that the new NAFTA — the United States-Canada-Mexico Agreement (USMCA) — is challenging private-sector organizations. So is Brexit. But policy developments that challenge traditional manufacturing culture are not enough to explain this rapid month-to-month change. Multiple factors should be considered when analyzing manufacturing growth numbers to ensure we can see the future forest through the trees of today’s economic indicators. This is why we look to numbers: an increase or decrease can indicate larger socio-economic trends we are already observing and analyzing. The Purchasing Managers’ Index (PMI) is the official way to keep track of private-sector manufacturing. Every month the Institute for Supply Management (ISM) sends 400 senior executives surveys on "new orders, inventory levels, production, supplier deliveries and employment." The PMI number is generated from these surveys. These numbers can have quite a domino effect on all manufacturing sector areas. Production managers use the numbers to plan for the near future; this includes purchasing decisions like raw materials and the hiring or firing of employees. Suppliers to manufacturers anticipate demand for its own products, such as machine parts. December’s contracting manufacturing areas include: "Printing & Related Support Activities; Fabricated Metal Products; Nonmetallic Mineral Products; Petroleum & Coal Products; Paper Products; and Plastics & Rubber Products." There’s special concern in the area of new orders, which fell 11 points from November to December 2018. This could be related to the seasonal supply-side demand chains, but it could be indicative of an overall manufacturing decline in the U.S.
Of course, the PMI is a good indicator of job growth and stagnation, too. While December 2018 boasts a 2.2 percent manufacturing employment increase, U.S. manufacturing jobs have generally been on the decline. The Bureau of Labor Statistics (BLS) anticipates a drop from 19.5 million to 11.6 million by 2026. This is an important overarching prediction to keep in mind as we witness small increases and decreases in production month to month. This predicted overall decline by one government agency contradicts the rose-colored optimism emanating from the White House these days. The vision coming from the White House regarding job growth in general remains surprisingly optimistic, although many workers are not feeling the same way. According to the White House, 2018 remains a year of growth, with 312,000 jobs reportedly created in December. But of three major areas, manufacturing weighed in at 32,000 new jobs in December, while hospitality and leisure produced 55,000 jobs, and education and health services produced the most jobs at 82,000. The White House explicitly states that the manufacturing sector job growth is the highest in 21 years, reporting: "Manufacturing has been a bright spot since President Trump’s election, and now averages 20,000 new jobs per month compared to 8,000 per month in the four years prior. The 284,000 manufacturing jobs created in 2018 was the most the industry has added in a calendar year since 1997." 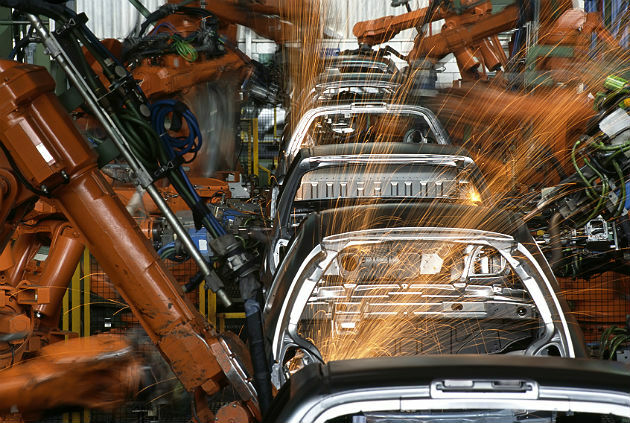 Amidst the vast disagreements on U.S. manufacturing’s future, questions loom. PMI is one way to gauge the manufacturing climate, but official political rhetoric conflicts with the numbers. Does the U.S. have a strong manufacturing future? Or are we in a steady decline, like that anticipated by the BLS, whereby calculated monthly decreases and increases are less significant events compared to the overall bleaker manufacturing decline forecast?